Locking Blades – Blades lock into the blender base providing reliable and safe operation. 2 20 oz. Bottles Included – BPA free bottles are great for active lifestyles. Button Action – Broken jars and stripped blender drives are a thing of the past with easy single button blending. 250 Watts – Powerful motor is up to the task of blending fresh foods and ice for all your favorite drinks. 8 oz. Jar and Grinder – Perfect for grinding coffee, baby food, nuts & spices. No more bulky blender for making your morning smoothies. 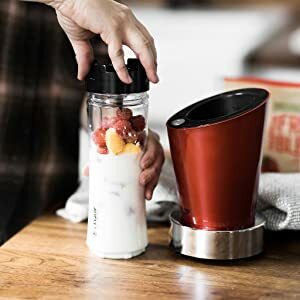 This specifically sized blender is perfect for single serving smoothies, iced coffee, and protein shakes, or your favorite drinks in seconds. The blades lock into the blender base providing safe and reliable operation. This powerful 250W motor is up to the task of blending fresh foods and ice for all your favorite drinks. Don’t dirty more dishes! 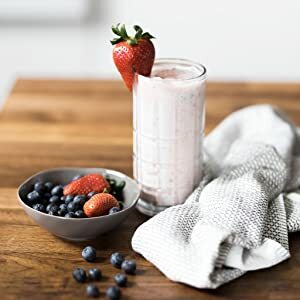 The Personal Blender doubles as a cup for you to drink your single serving smoothie out of, so you don’t have to worry about cleaning up more mess than necessary. Whether it’s an on-the-go breakfast or a mid-afternoon snack, the Personal Blender makes just the right amount.